Garuda Indonesia Presents Business Class with "Super Diamond Seat"
Tangerang, INDONESIA, Feb 2, 2016 - (ACN Newswire) - As a part of its fleet revitalization program along with its service enhancement program as a "5-Star Airline", Indonesia's national flag carrier airline, Garuda Indonesia, on Monday (February 1) presented its new aircraft including the Airbus A330-300 with its "Super Diamond Seat Business Class" and the 10th Boeing 777-300ER. The Airbus A330-300 with its Super Diamond Seat Business Class, registered PK-GPZ, is the first out of four Airbus A330-300 that will be delivered in 2016, while the PK-GIK Boeing 777-300ER is the last delivery of the ten B777-300ERs that were ordered by Garuda in 2013. "The arrival of these new aircraft is a part of Garuda's commitment to present a modernized fleet with the best service, in line with its business network expansion program in Asia Pacific, Middle East and Europe region," explained M. Arif Wibowo, President & CEO of Garuda Indonesia, at the "Welcoming The Airbus A330-300 with Super Diamond Seat Business Class & The 10th Boeing 777-300ER Garuda Indonesia" event in Hangar 4 GMF Aero-Asia, Cengkareng. Arif Wibowo added, as a national flag carrier awarded with a "5-Star Airline" rating, both service and safety are mandatory for Garuda Indonesia. These new additions in Garuda's fleet are hoped to offer more value to all of Garuda's customers, particularly the "Super Diamond Seat Business Class" integrated with the "Garuda Indonesia Experience" service concept which will present a distinct service and comfort for business class passengers. The Airbus A330-300 enjoys a maximum range of up to 15,000 kilometers or equal to approximately a 12-hour non-stop flight. 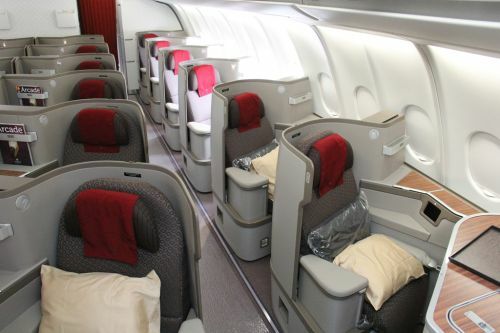 The capacity is 287 seats consisting of 24 business class with "Super Diamond Seat" and 263 economy class seats. Focused on enhancing both comfortability and privacy, the "Super Diamond Seat" business class is equipped with some new features in each seat offering a better flying experience such as the ?all-isle? configuration (1 - 2 - 1), latest 16" in-flight entertainment LCD touch-screen Panasonic Ex3 equipped with a touch-screen handset/remote, double USB plug, and power outlet; fully flat-bed seat, with a 24" width and 82? length, adjustable arm-rest, head-rest, meal table and reading light, integrated baby bassinet stowage, and new mini bar display. "In addition, through all the new features in the "Super Diamond Seat" business class, Garuda Indonesia is the first airline in the world which implements the service on its A330-300 aircraft; diverse from competitors that implement it only on their A350 aircraft," Arif Wibowo added. Besides presenting new features in its business class, the economy class seat also has an 'articulating recline' ability which allows passengers to recline their seats up to 4" reclined, and foot-rest. Equipped with an 11" LCD touch-screen in-flight entertainment with handset/remote, USB plug and power outlet in each seat, ensures Garuda Indonesia is the first airline in Asia which implements the in-flight entertainment set in the economy cabin. Meanwhile, the 10th Boeing 777-300ER delivered to Garuda Indonesia, and registered as PK-GIK, is configured with 393 seats capacity, consisting of 26 business class seats and 367 economy class. Six out of ten Boeing 777-300ERs operated by Garuda Indonesia are equipped with First Class service, with 8 First Class seats, 38 Business Class seats and 268 Economy Class seats configuration. As part of the fleet revitalization program, throughout 2016, the Garuda Indonesia Group will receive 16 new aircraft in total; 1 Boeing 777-300ER, 4 Airbus A330-300, 4 ATR72-600, and also 8 Airbus A320 to be operated by Citilink. By the end of 2016, Garuda Indonesia Group will operate a total of 188 aircraft; 144 aircraft for Garuda Indonesia and 44 aircraft for Citilink. To continue its positive growth reached by the "Quick Wins" program in 2015, in 2016 Garuda Indonesia is to execute a "Sky Beyond" strategy for short-term company expansion program, which is focused on three ?core strategies? as in company group synergy, effectiveness and efficiency, and service enhancement to accelerate company achievement and performance. President & CEO Garuda Indonesia M. Arif Wibowo was simulating the operational of in-flight entertainment in Airbus A330-300 business class with Super Diamond Seat. Each seat in-flight entertainment is LCD touch-screen Panasonic Ex3 equipped with a touch-screen handset/remote, double USB plug, and power outlet. President & CEO Garuda Indonesia M. Arif Wibowo (left) with President Commissioner Garuda Indonesia Jusman Syafii Djamal posed in one of super diamond seat in Airbus A330-300 PK-GPZ business class. Garuda Indonesia is the first airline in the world which implements the service on its Airbus A330-300 aircraft; diverse from competitors that implement it only on their Airbus A350 aircraft. The view of business class with the Super Diamond Seat. On the Airbus A330-300 PK-GPZ configured with 24 business class seats and 263 economy class seats.